Here we go! 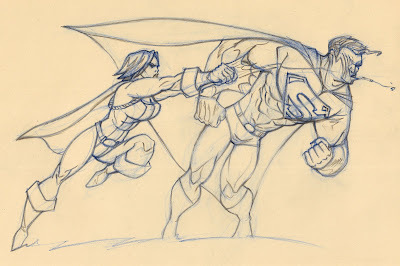 PowerGirl punching (did I say kicking before?) another Kryptonian's face! Again, I'm totally ignorant about PowerGirl. I thought that she was just another character that happened to be super strong and have the ability to fly. From my quick lesson, I learned that she was also another survivor from the Planet Kryton II and she crashed landing in Planet Earth II (while Superman landed on our planet), that's like another dimension of our universe or something. I've seen her character around and seen her drawn by some artists, but that's as far as my awareness of her existence goes. So here's my take on last week's theme.